The season consists of a 10 week regular season, a postseason and a county cheerleading competition in which all clubs will participate in. Practice for the 2018 season will begin on August 20th, 2018. You will be contacted by your coach as to times and location prior to this date. Practices are normally 2-3 times a week depending on your team lasting one to two hours. Flag is 2 times a week for one hour. All coaches are required by Calvert County Parks and Recreation to be certified. Each Dunkirk Warriors coach will need to be certified in order to coach in the Calvert County Youth Cheerleading league. Please visit www.nays.org for information about certification. 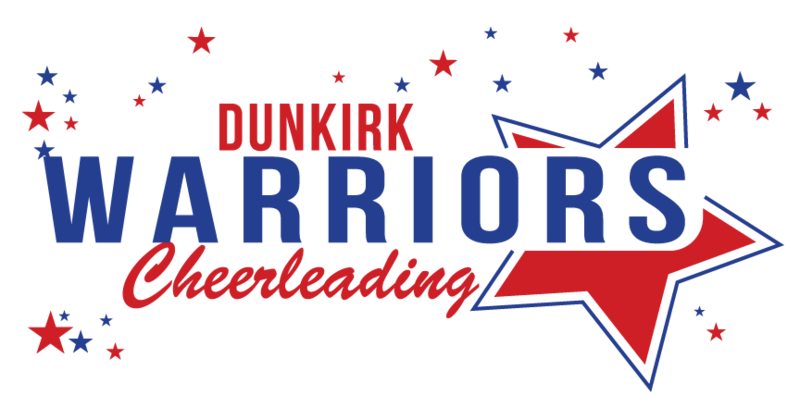 The purpose of the Dunkirk Warriors youth cheerleading program is to provide an opportunity for youth to cheer within a prescribed age limit and to learn the fundamentals of cheerleading while having fun and supporting our youth football teams. The goal is to instill the will to win and the courage to accept defeat or disappointment with and emphasis on fair play and good sportsmanship. Cold Weather Gear- This year, we are not offering the turtleneck. We ask that you purchase a white long-sleeved athletic shirt from Walmart, Target or a sporting goods store (they may be in the boys or girls section). This is required for all cheerleaders. If you have an item from last year that still fits you do not need to buy a new one. We will be working on optional items for purchase in the future. Look for an email to come out with more information. This years competition will most likely be held at Huntingtown High School in November on a Sunday. More information about competition will be distributed by your coach once we have started the season. We are looking forward to a great season!!! GO WARRIORS!! !